Our online practice test is the perfect way to prepare for the 70-761 certification. 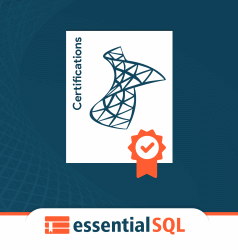 Help you study all topics covered in the certification. It includes ten quizzes covering 23 topics. That’s over 200 practice questions! Updated to include SQL Server 2016 features. studying with quizzes helps make sure the material sticks. practice tests promote wise use of time. You won’t get this type of support anywhere else! It is truly worth the $39.98. 100% Risk Free, 30 Day Money Back Guarantee! Got Questions? Please contact me so I can help! “Your quizzes are very helpful, detailed and consolidated. Whatever I learnt across web was consolidated and explained in depth. I really appreciate your effort and time. Thanks for that.” — Ashok K.
Want to Purchase with PayPal? Look for the button at the very bottom of the form, our company name is Easy Computer Academy, LLC.